Written before airing: These new stills excite me. I am holding out hope that Tae Seo will snap out of his hypnosis soon and it seems from the stills he is fighting off GW’s men. Kang Chi also looks uninjured, getting cozy with Yeo Wol. My heart weeps for Chung Jo who has been left at the Choon Hall but I am glad that Kang Chi and Yeo Wol have been given time to get to know each other better. 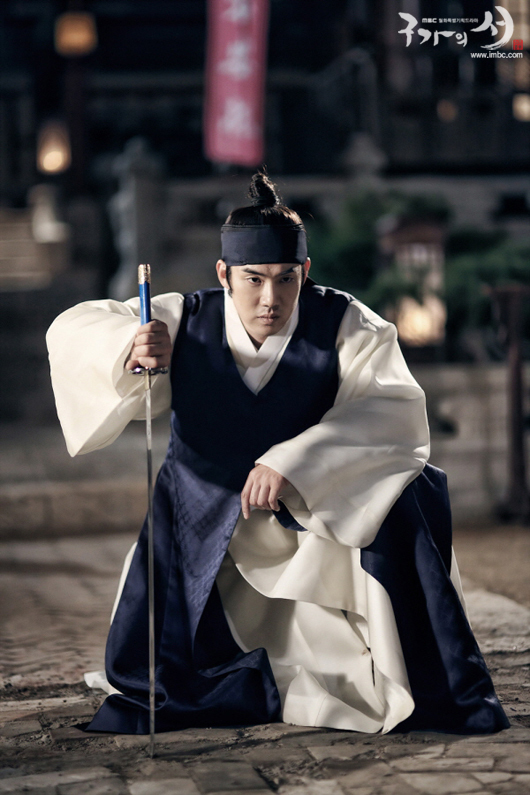 TS comes out of a room carrying a sword. KC is happy to see him. He rushes over but TS stabs him. Blood spills out of KC’s mouth. KC reaches out to TS. 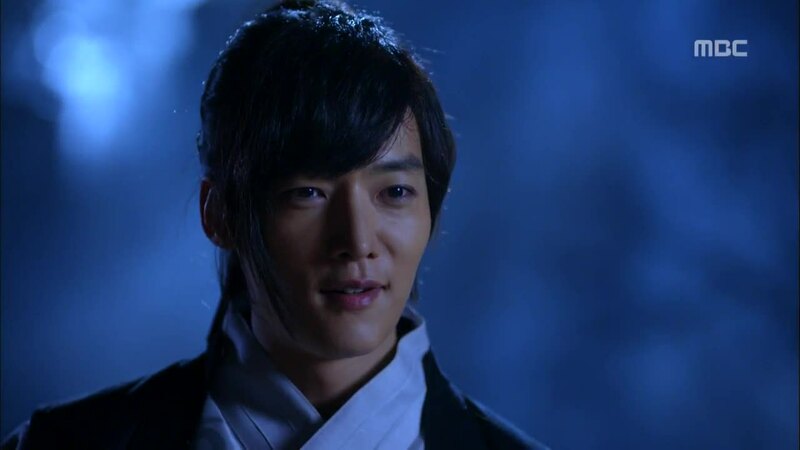 TS asks how Kang Chi could have killed his father so cruelly. “I will not forgive you. 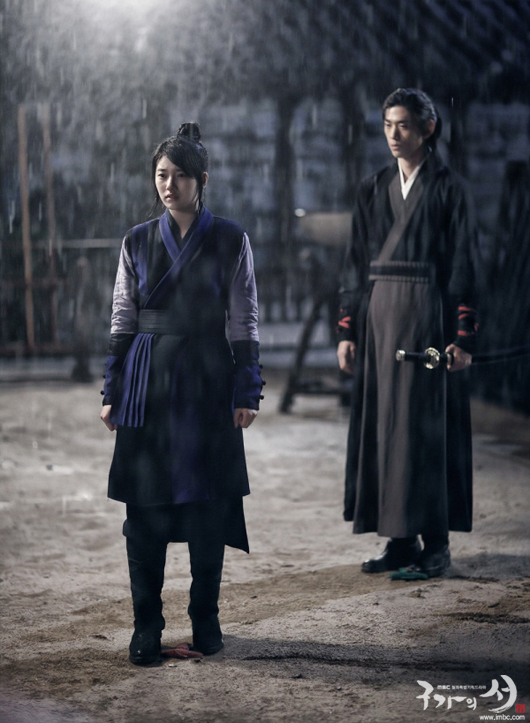 Die!” Kang Chi falls and TS moves to deliver the final blow but YW blocks him. TS tells her to move but she refuses. TS grows angry at YW but Gon knocks out TS. YW rushes to KC and holds him. KC faints in her arms. WS is angry at CJ’s audacity. CJ asks if the best gisaeng in Choon wastes her energy bullying the helpless. Infuriated, WS asks if CJ is not afraid of anything. CJ says she has no pride anymore so she has nothing to be afraid of. WS gets up and undresses. The other gisaengs follow. WS wants CJ to wash all the clothes. PJ wants to know why TS tried to kill KC. TS asks how PJ can protect KC- he killed MS! Gon thinks TS must be confused a bit but PJ suspects more because TS keeps saying he saw the murder with his own two eyes. PJ asks TS to look him straight in the eye. He asks, “Who else was there?” Confusion and doubt flashes across TS’s face because he can’t remember but he insists that he say KC killed MS. PJ tells TS seems to be under some trance. PJ explains the situation to YW. This trance is especially more powerful because it was done while TS was unconscious. The one who put him under it can only break it. Otherwise it will end only when TS finally kills KC. KC asks why TS keeps declining all the marriage offers. “Are you really afraid of women like CJ said you are? Or do you have someone in your heart already?” TS smiles a knowing smile. KC notices and immediately wants to know who it is. TS refuses to tell him. Uh-oh, I remember how he looked at YW. CJ hangs the hanboks dry. Gisaeng arrives and says they are not clean enough and pulls the clothes off, dropping them on the floor. CJ is horrified. WS watches and smirks. CJ’s eyes fill with tears as she stares as the hanboks on the dirt ground. Gritting her teeth, she picks them up. She takes a deep breath and gathers herself. Stay strong, CJ. Stay strong. YW paces outside worried about KC. Senior student tells her that KC might not live past this night if he keeps spilling so much blood. YW enters the room. She sits by KC and feels his forehead and sighs. She notices the scars on KC’s forearms. She traces them gently, knowing he must have gotten them trying to save her those both times. YW enters the room. She sits by KC and feels his forehead and sighs. She notices the scars on KC’s forearms. She traces them gently, knowing he must have gotten them trying to save her those both times. YW sees the red bracelet on KC’s wrist and remembers that KC heals quickly without it on. She starts to take it off but remembers SJ’s warning. He warned her against meddling with KC’s fate. YW protests. She wants to help KC become human. 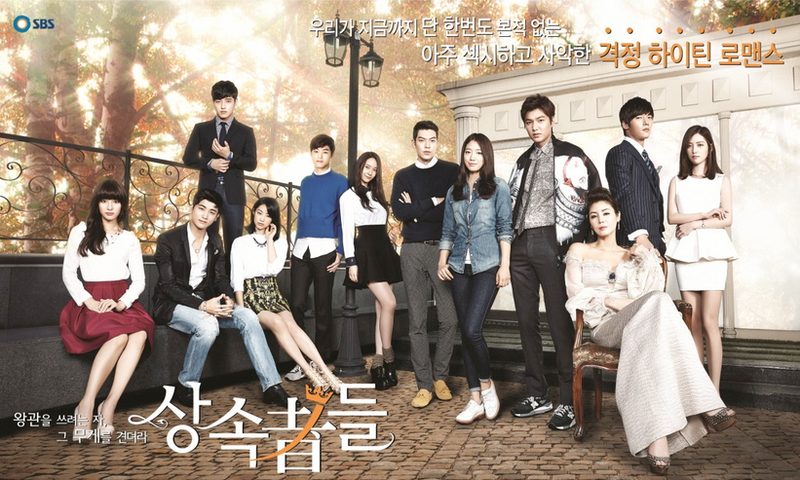 She tells SJ not to worry about their pre-destined fate. She just wants to help him as a friend and KC thinks she is boy. SJ asks her to promise to only be his friend and not meddle in matters of KC’s life and death. YW looks down at KC. She thinks to herself, “But this guy is dying and I can’t just standby and watch.” She apologizes out loud to SJ and yanks the bracelet off, keeping her eyes closed in fear. She opens them and sees that KC is still unconscious. She removes the bandage to check the wound. Nothing has happened! Suddenly blue lights start to float in the air and settle in KC’s open wound. It heals instantly! YW gives a sigh of relief. Suddenly, KC’s eyes flare open, revealing that Beastly KC is back. He knocks YW over, choking her. KC growls at YW, “What did you do?” YW carefully shows him the bracelet. She says, “I was just trying to help you heal.” KC remembers that he was stabbed earlier. YW, who has been wounded by KC, holds out the bracelet to KC. “It’s okay. Here. You need to put it back on. Give me you hand, Kang Chi. 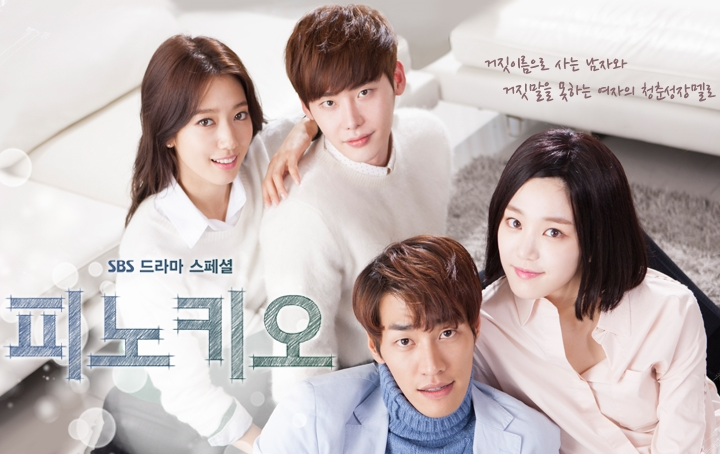 Give me your hand.” KC stops growling, mollified by YW’s gentle voice. He slowly extends his hand bracelet and YW slides closer. She puts the bracelet back on him. He lets her do so quietly and his eyes change back. Human KC faints on top of her. Of course Gon comes in at this very awkward moment. YW asks for Gon’s help. Gon is holding up unconscious KC while YW is wrapping a bandage around KC’s stomach. Gon asks why she is putting bandage back on KC when the wound has healed. YW replies, “To keep his identity a secret from the other students.” Gon tells her that some people already know. YW wants to keep the numbers small. Gon notices the wound on YW’s arm. Angry, Gon drops KC and leaves as soon as YW is done with KC. YW follows Gon outside. She says, “You’re not going to tell father, right?” Gon angrily replies, “What? That you took off the bracelet or that you almost died?” YW explains that her wound was just from knocking over the candlestick. Gon swears that he will kill KC if she gets hurt because of him and leaves. YW crouches on the ground in weariness. TS has seen this scene from afar. KC snores in his sleep, blissfully unaware. SR finds CJ leaning against the beam in exhaustion. She warmly says, “You must be tired.” CJ denies it. SR tells her to follow her and takes CJ to a room with the drums that SR played in the beginning of the drama. She says to CJ (I didn’t catch this dialogue fast enough), “Living as a gisaeng can be degrading. But I don’t think it just that. You can learn a lot. Taking care of the household is not the only way a woman can live. 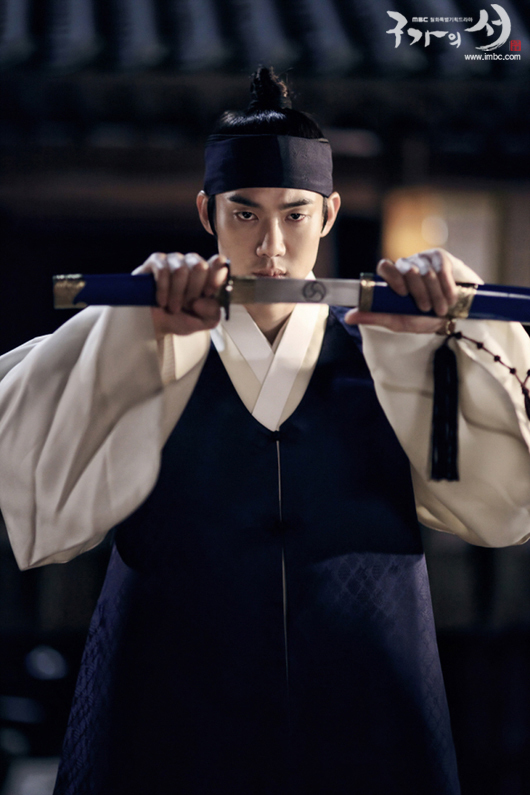 You can pursue your dream.” SR tells CJ to become a yae–gi (a gisaeng learned in the arts) and live her life again. CJ stares meaningfully at the drums. Student reports to PJ and YW that KC has disappeared. PJ asks how an injured person can disappear. Another student called Sung runs into KC, who is eating ravenously in the kitchen. KC asks Sung if there is meat. Sung replies, “I can’t take food on my own.” He tells KC that there is someone else who takes manages the food at the school. KC, for some reason, is sure that the man will be stingy. Unfortunately, that “stingy” old man has entered the KC. Sung sees him but KC doesn’t. The grandpa hits KC in the head. Ha! Reminds me of YW. Of course, KC’s temper gets the best of him so Gong-dal (GD) uses his skills to bring KC to his knees. GD says to KC, “You need to say your greetings properly first.” Suddenly, KC gets another slap. It’s YW. GD limps away, making you doubt he was the just man who moved like the wind, beating up KC. YW pulls KC out of the kitchen by the ear. Sung wonders how KC can be so fine after yesterday. YW asks if KC has a brain. “How can you appear so fine after last night?” Other people can’t know about KC’s real identity. After some of the usual bickering, KC suddenly grows sincere. He asks YW if she took off the bracelet. YW replies that she did it to help him live. He was going to die from blood loss. KC surprisingly says thank you but he tells her to not do it again because she can get hurt. Gon appears (with new hair that I don’t like). PJ is looking for him. KC reads motto of the school. Totally missed this hard line. YW teaches him to call him Master. PJ asks if KC is okay. KC says he is okay too readily. YW slaps him. KC quickly feigns pain. Gon appears with TS who is blindfolded. Seriously, it’s just seeing him that makes him want to kill him? Way to make up your own arbitrary trance rules, writer. KC and TS sit side by side in front of PJ. PJ says to them, “You two are here because of my friendship with MS. But to stay here, you need to prove yourself. If either one of you is judged unworthy to be a student here, you will be expelled.” KC asks who will do the evaluation. PJ tells him that there are four other teachers- virtuous men- in this school who will make that decision. PJ tells TS to fight to keep his murderous desire down through his own will. PJ tells KC to not to appear in front of TS often or provoke him. KC stares at TS. He yells, “Are you saying you tried to kill me because of a mere trance? That I have to avoid you?” KC declares that he won’t. TS tells KC to do as he is told by PJ. KC replies, “They didn’t save you just so you can be underneath some trance. CJ and Han-no didn’t risk their lives to save you just for this. So you conquer the trance. Whether you stab me again or if that is not your will, I won’t avoid you.” Ooh, I liked this reaction from KC. Dangerous and dumb, perhaps, but I still like it. KC kicks open the door cursing GW. GD, who has been sitting outside, surprises him. GD tells him it’s time to eat and limps away again, complaining about his aching joints. TS shows YW and Gon a map of inn. He tells her of the secret room filled with 5000 nyang. The plan is to take the money out of the room with GW knowing. Choi is brought into room. GW asks if Choi has thought about his crimes. Beaten up and starved, Choi fearfully answer yes. 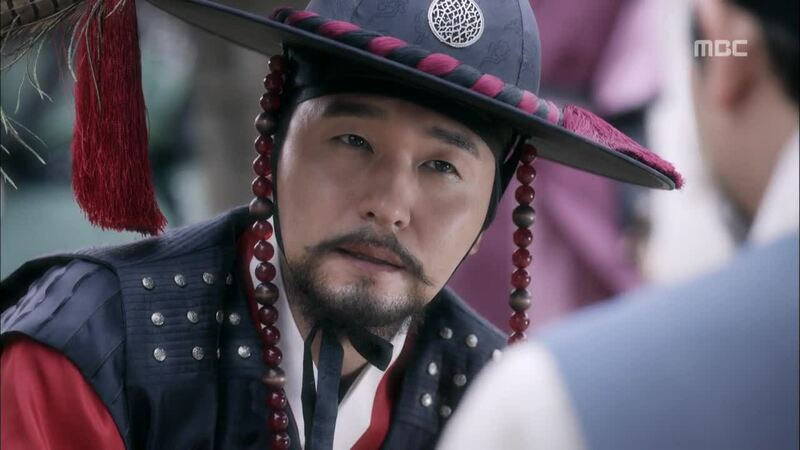 GW threatens Choi, saying his life is in his hands so he must answer everything truthfully. GW asks if MS had some other money. Choi replies, “What?” GW throws Choi the account books. MS’s wealth is well known. How come the books record so little? Choi doesn’t know what GW is talking about even though GW threatens him again. Choi trembles. “I really don’t know anything!” GW believes him. Oh. Thank. Goodness. TS says that there is only one entrance to the secret storage room and it is in MS’s room. Carpenter is called in by PJ. SS planted the carpenter because he knew that GW would ask for repairs to his floor. Carpenter reports that GW wants the room repaired in four days. TS asks the guy if he can be trusted. Carpenter replies that he owes MS. YW ask how PJ knew GW would want repairs. KC finds GD eating a nice whole hen in the kitchen. KC is furious that GD is eating so well while giving him so little. GD remarks that KC must not be human. GD jabs him in stomach. “Humans can’t heal this fast.” KC passes it off and they start to bicker. GD says if you can take this broom from me, you can have the chicken. KC attacks but he is completely foiled by gramps. GD giggles in glee. KC says that GD can’t just be the kitchen servant. GD reveals that he is one of the four teachers. He is called Teacher Jook-dal and is represented by the bamboo symbol. GW has come to stay at Choon Hall because his room is undergoing repairs. GW sees CJ cleaning. His eyes stay on her even when WS asks him if he want to go inside. He steps toward her. CJ tries to walks away but GW tells her to stop. He moves draws her face toward him and says, “You are truly like the moon and beautiful as a flower.” Basically, she is a beauty. SR observes from afar. KC puts on a mask, following other workers into the inn. GW’s henchmen are also there. KC thinks the main evil guy is calling him but he is actually calling another worker. He asks, “What is the curtain doing here?” The curtain has covered the entrance to MS’s room. Repair guy explains it’s because of the dust. Gon and YW are also there with masks on. They go into the room. Something makes evil guy suspicious. Gon and YW are surprised to see KC in the room. KC tells them that PJ doesn’t know he is here. YW tells him to return but KC hasn’t heard her because he was too focused on the sweat on YW’s forehead. He feels her head. Gon pushes his hand off. “What are you doing? !” KC retorts, “What are you doing? Didn’t you notice the fever?” YW says nothing. KC feels her forehead again and Gon knocks his hand off again. KC yells at Gon, “ Are you angry because you didn’t notice first?” The two boiling pots of testosterone start to fight again so YW tries to calm them down, warning them of their current situation. Suddenly, they hear the voice of carpenter. Evil dude is coming in. Carpenter tries to stop him with cute little headbutts but evil guy pushes past. Thankfully, only Gon is in the room with the mask on. Evil guys asks carpenter, “What is the picture still doing there?” GW treasures the picture so they need to remove it to keep it safe. KC and YW are actually hiding in the back. They try to move but YW trips, making a sound. KC catches her before she falls but evil guy heard the sound. Uh-oh. And double Uh-oh. KC has his hand on YW’s chest. Outside, evil guy orders Gon to move out of his way. PJ: What do you mean that YW and KC are (can’t here) together? KC: Oy, Dam-goon, are you really okay? 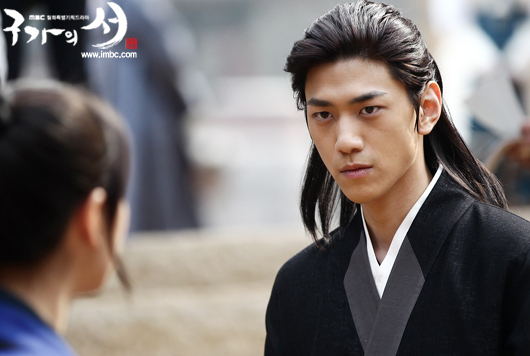 YW: It’s Yeo Wol. My name is Yeo Wol. GW: Did you say Park Mu Sol’s secret storage room? Bring me information regarding the Mu-hyung dojo and the 5000 nyang. If you don’t obey, your sister will suffer the consequences. PJ: How could it have ended so fruitlessly? Carpenter: I think it’s too early to conclude. Judging from the preview with KC’s dialogue, yes, KC is that dense. Or YW’s chest is very flat. I bet YW becomes offended that KC couldn’t tell. Ha! Poor YW. She ends up having to tell him herself. It seems her hair will fall like a shampoo commercial again. Prepare for slow motion approached from all angles, people. I like the analogy drawn between KC being prejudiced against by TS because of his temper and YW because of her gender. While TS doesn’t know that KC is half-beast, in the story, KC’s wild and stubborn side is portrayed as something that sets him apart from other rational and civilized people. That side of him can be attributed to him being half-beast. YW sees that connection, which explains her empathy and sympathy for KC’s plight. Her gender defines what she is allowed or not allowed to do in society. If she didn’t go parading around like a boy, she wouldn’t be able to be part of society the way she wants to. This is similar to KC’s situation, first as a person abandoned by his parents and now as half-beast. We don’t know how YW came to be a cross-dressing martial artist but she overcame her obstacles and found a way to make a place for herself in the world. We can only wish for the same for KC. Written before aired: I keep forgetting that Kang Chi doesn’t know that Yeo Wol is a girl because she is so obviously one. I suppose it speaks volumes to how defining gender roles in Joseon can be, with no one suspecting that Dam do-ryung is a girl. A girl would never be caught running around like Yeo Wol does, possessing those type of martial arts skills. The mistaken gender does not play a huge role in the story now because I think even if Kang Chi knew, he would still have no space in his heart for Yeo Wol. 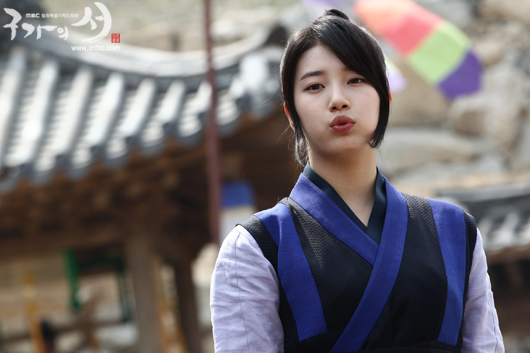 Written before aired: I’ve written before that Chung Jo and Kang Chi are doomed because she is too much like Seo Hwa. 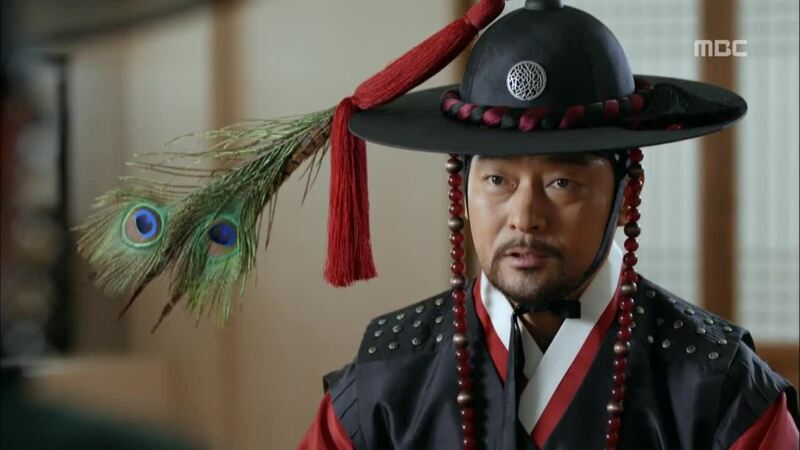 The drama is making this even clearer with Chung Jo being hauled off as a slave to be made into a gisaeng. 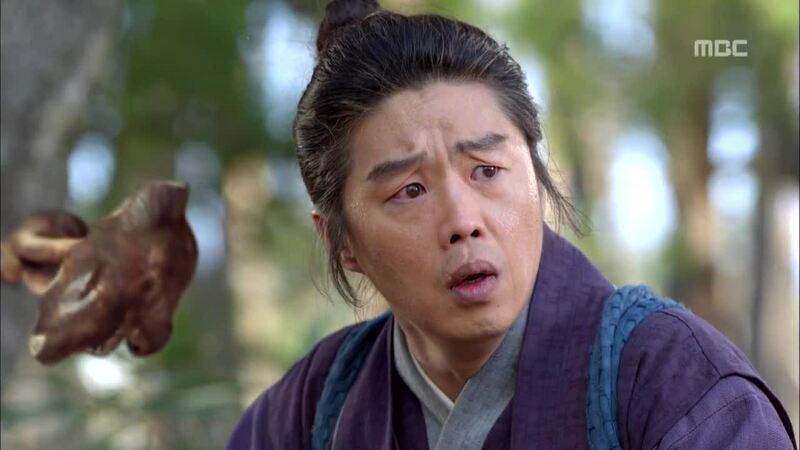 I don’t want Chung Jo to die because that would be just too coincidental but where is the room in Kang Chi’s heart for Yeo Wool if she doesn’t? 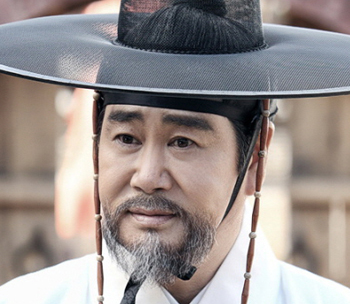 Things are not looking good for Chung Jo, is it? Recap will be posted here. Boy, am I excited. With the first real evidence of Kang Chi’s real identity being revealed to last person who should know- Gwan Woong- the stakes are rising. While Gwan Woong remains a one-dimensional villian, at least he is a force to be reckoned with, keeping everyone on their toes. How will everyone react to MS’ death? Will they blame Kang Chi? Mom certainly will but what about CJ and TS? I know TS and KC grew up together but what is their friendship really made of? MS may have seen KC as a son but did TS see him as a brother? Truly? Not only do we have to think about what makes someone human but we also have to think about what makes a family, especially in the Joseon context with strict social statuses that shape every moment and aspect of life.